Ray Chaplin from equineexcellence.biz, an Australian breeding consultant, has produced two reports lately which may be of interest to many. One report looks at why New Zealand bred sires seem to be making more success in terms of excellence at stud than Australian based sires – the old sports rivalry of All Blacks vs Wallabies (rugby) and Silver Ferns vs Diamonds (netball), but in this case the rugby results tend to reflect the successful sire results, with New Zealand getting an edge. Coincidentally one of New Zealand’s best sires of the modern era is Christian Cullen, named after a very quick thinking, quick stepping New Zealand All Black rugby player. Ray’s second report looks at an Australian sire Classic Gary that he identified in his first report as being an exceptional Australian-bred sire. Why was he so successful and others not? What I like about Ray’s reports (available free online through this web address: is that he has put a lot of thought into developing way of assessing the attributes (genetic compatibility and a range of performance standards) of mares and sires to come up with probabilities of success. Now, I can’t say whether I agree with his algorithm or not, because it is commercially sensitive and therefore the genetic side of things remain “the Kentucky Fried Chicken recipe” – out of our ken, but results indicate customer and investor satisfaction! On that topic, Ray has recently published another (free) report, showing his success rate statistically. Tip o’ the hat for that, Ray! Ray’s reports are recommended as well researched and thoughtful (which is the “think b4 breeding” part of my blogsite name) if frustrating reading that helps provoke us breeders to be more focused in our decisions. While you are there, ask Ray to add b4breeding.com to his list of recommended websites – I know I don’t offer a pedigree matching service, but hopefully I get people thinking for themselves. 1 + 2 + = + $ + V + U + ? I believe that learning and thinking about each part of this equation will enable breeders to improve their ability to breed successfully. If I was revising the order of this equation I would probably put the “U” right at the front, because a I’ve mentioned before, what you are breeding for is a key decision that can set parameters on several other decisions you need to make. Now and again, I like to blog on some of the horses who are creating a lasting legacy as a broodmare sire, even if they could not create or continue a siring line themselves. Tar Heel is the classic. If you look at the usual “family tree” of the sons of Hambletonian, the Dictator siring line is virtually a stub. And yet the influence of that line via Billy Direct and his son Tar Heel is still potent in the structure of many of our best performing horses and top breeding lines today. Another Hambletonian siring line “stub” is Bert Abbe/Gene Abbe – but again, Big Towner’s influence as a broodmare sire is reaching far down in some of the best breeding lines of the modern era. Overtrick is another example. He sits in the Hambletonian family tree under the Happy Medium siring line, a very interesting line that includes Peter The Great and Volomite, and has kick started again for pacers via Sampson Hanover (a son of Volomite), who was the grandsire of Direct Scooter. That siring line has caught alight in recent times thanks to Matts Scooter and In The Pocket. It is a line that historically stands out for its prowess in producing top broodmare sires – in reference to my previous blog, great workers in the engine room of pedigrees. Overtrick is a great grandson of Volomite. He was a brilliant two year old and continued to be a top race horse through his 3 and 4yo seasons, setting 8 world records along the way. By New Zealanders he is remembered for his battles with Cardigan Bay (one race was in front of a crowd of over 35,000 people at Yonkers!) He was an adequate sire, producing tough, sound horses rather than passing on speed. After 10 seasons at stud in the States without leaving anything really outstanding, he was bought by Australian interests. John Bradley (“Modern pacing sire lines”) notes that Overtrick was definitely a better sire of colts than fillies, but many of his daughters have become fine broodmares. A few of them have ensured Overtrick’s enduring contribution to great pacing bloodlines in both hemispheres – as the damsire of No Nukes and Falcon Seelster, and grandamsire of Cam’s Card Shark and Christian Cullen, to name some of the most notable ones. I would be keen to hear from those blog readers in Australia who can throw some light on how Overtrick was received there, and on his Australian record (as a sire 521 foals, 239 starters, 173 winners/as a damsire 1482 foals, 708 starters, 454 winners). It’s not bad, but it is not outstanding. Has his influence in Australian maternal lines turned up at any stage? Or was there a lack of compatible sires available when his daughters were needing them? My personal guess was that Overtrick mares may well have done better with some of the well bred imported sires we were standing at the time in New Zealand. 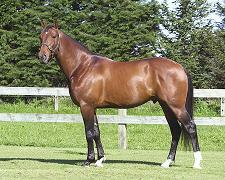 In New Zealand the incredible contribution of Falcon Seelster and Christian Cullen to our maternal lines will keep Overtrick’s influence alive for a good while to come, and give breeders some interesting choices with sires like Real Desire, Santanna Blue and others with No Nukes in their maternal pedigree now available. What makes Overtrick tick? John Bradley points out that Overtrick’s first five dams are 2:00 producers, and this includes mares foaled from 1927 to 1954 – quite an accomplishment in that era. His grandam is Barbara Direct, a Billy Direct mare, and Billy Direct is another excellent broodmare sire who would have added value to that strong maternal line. My interest in Overtrick’s place in modern day pedigrees stems from looking to double up the Barbara Direct blood carried by Ballie Hanover, a mare I imported quite some time ago from the USA. Barbara Direct has established an influential branch of the taproot mare Minnehaha, and I recall reading an article in either Hoofbeats (probably) or Horseman and Fair World (possibly) singing her praises as a remarkable progenitress – sorry but I can’t find the article but think it was penned a dozen years or more as comment on some annual statistics. However, her blood turns up frequently, particularly via a son, Bullet Hanover and a grandson, Overtrick. Bullet Hanover,by Adios won the 1960 Little Brown Jug and while a champion pacer of his day, did not sire any horses as good as himself. His legacy flows from his fillies in the broodmare barn. Jennas Beach Boy descends from Barbara Direct maternally. Again, he was an out and out champion who left no siring sons of note. Nevertheless ,his progeny have performed well on the racetrack. Overtrick also won the Jug, in 1963 and history has recorded numerous head to head races with Cardigan Bay. However, he has not created his own siring dynasty. His son Mark Lobell came to NZ as an unraced stud – he was moderately successful in that department but did feature more as a broodmare sire, I think. Western Hanover has two strains of Barbara Direct-on the paternal side through No Nukes and,more importantly in my view via Bullet Hanover who, as the maternal grandsire,was in a position to influence (and probably did) the transfer of the X chromosome to this great sire. Champion stallion,Christian Cullen through an Overtrick granddam has Barbara Direct well placed to influence the passing on of the X chromosome the progeny of his fillies. In my view, Cullen’s legacy will eventually include an outstanding record as a broodmare sire. For my own part, I retain two descendants of Ballie Hanover, a daughter by Christian Cullen in Millview Ava who has just foaled a Real Desire filly (three strains of Barbara Direct). And a two year old filly by Elsu called Alta Michaela, in work with Mike Berger, who has four strains of Barbara Direct via Overtrick (twice), Bullet Hanover and Beauty Hanover. Some theories to reflect on…………. In one of my early blogs (originally an article for Breeding Matters magazine) I outlined my approach to pedigree matching by using analogies from cooking, knitting and land use mapping to explain what I meant. In this blog, I’m throwing a another strange analogy into the mix – the pedigree of a horse as a steam engine. Building the power of your mare’s family. 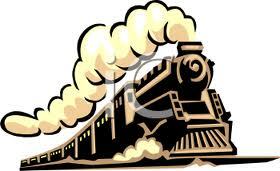 Visualise the pedigree of a horse as the engine room of a steam train. That’s where you find the hard working genes of quality mares, sires and damsires stoking the boiler that will keep a family performing consistently on a foal to winner basis, and over many generations. These are the hot, sweaty, muscular genes that are heads-down/butts-up scooping the coal into the furnace so that the resulting foals can produce results. These genes (and I’m not just referring to the heart size/ “x factor’) provide the two most important elements of great performance – power, which in turn drives speed. It’s something that can be build up and maintained over time, with the right pedigree matches – keeping the fire stoked, as it were. Or the furnace can be allowed to die down, and strong families run out of steam due to poor breeding choices over a few generations and it can take one helluva effort to get those coals going again. The other two key elements of a family’s great performance – temperament and conformation – might be visualised as the domain of the engine driver, tapping into the power from the boiler and regulating how it is used, ensuring the mechanical parts of the train are well oiled and working correctly, and steering the train from stop to stop (or foal to foal) along the track of time. There is much debate about where a horse’s temperament and conformation mainly come from. It’s not as black and white as y chromosomes and x chromosomes, and it’s not as simple as nature or nurture. 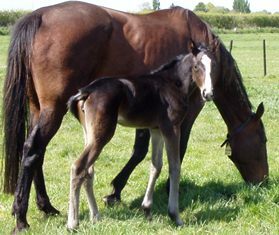 Anyone who breeds knows that some foals will have a similar temperament to their dam, others seem to take after the sire. Some sires “stamp” their foals more than others, and some dams do the same. And often you get some aspect of a foal (markings are the visually obvious one) that is a throw back to the past or seems to come out of the blue. 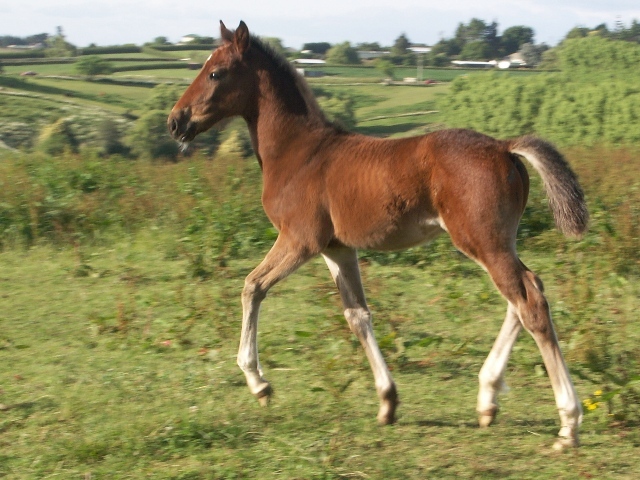 But there are things a breeder can do to maximise the chances of improving conformation and avoiding bad temperament traits – some by breeding choices and some by the way a mare/foal are managed. I recall wise words from Andrew Grierson and Sandy Yarndley when I did my articles about ‘stamping’ – warning about blaming or crediting too much about temperament on the sire, with Sandy noting that the temperament of a foal is often more influenced by the people who handle it, and Andrew pointing out that the foal spends much of its formative months with the mare, and she is likely to be more of an influence on the foal’s temperament than the sire’s genes. So in a way, the breeder’s role is to make “engine room” choices that keep the fire crew strong and happy feeding the boiler, and “engine driver” choices that maximise the chances of staying on track to your desired destination. What do mares read when we’re not looking? It’s breeding time, and it can be a hectic, nervous time for breeders. Are you looking for speed? Tintin In America’s first foals are arriving – it was great to see the photo of Ultimate Arma’s gorgeous looking, leggy filly (photo) and Peter O’Rourke of Nevele R tells me the second of his foals on the ground is a ‘big strapping colt” in Australia that the breeders are thrilled with. So that might settle a few worries about Tintin leaving small foals! As readers of my blogs will know, I made that point some time ago. Tintin may be well suited to bigger mares, but more for the ‘kick’ he could give them than for any certainty that he will downsize them physically. I hope to keep you posted as more Tintin foals arrive. I am the breeder of Tintin In America but I have no financial interest in him as a sire. I say that upfront, because this is a plug for Tintin as a great option for breeders who are looking for exceptional speed and competitiveness in a sire. Why? Because he offers a lot, and at an incredibly affordable price. Breeders who find Bettor’s Delight, Somebeachsomewhere or Rock N Roll Heaven out of reach for their mares have now got the option of going to a multi-Group 1 performer who raced at the top level as a 2, 3 and 4 year old, who possesses almost freakish high speed, has absolute determination to compete and win, comes from an outstanding family, and has a genetic structure that will allow many mares to potentially ‘click’ with him. That’s 5 very good reasons to consider him right now. Add high fertility and you’ve got 6. There have been few horses in recent years who possessed such a potent burst of high speed. Not just a quick sprint up the passing line, but extraordinary high speed that could be sustained over 200 to 300 metres, with never any hesitation or loss of gait. No wobbles, just woosh! There are other good New Zealand-bred sires currently available in the “economy seats” that also showed precocious ability and speed as young performers – Gotta Go Cullect (his record as a 2yo was 1:57, and best winning time over his career 1:57), Gotta Go Cullen (1:58.3 and 1:57.3), and Ohoka Arizona (1:56.2 and 1:56.2). Changeover (2:00.2 and 1:53.4) was not a natural 2yo type and more of a staying type, but did form a terrific record over many seasons at consistently fast times. Tintin In America’s equivalent times are 1:55.9 as a 2yo, and 1:53.2 lifetime record. In fact over the 3 seasons he raced his record was 1:55.9 as a 2yo, 1:53.2 (in New Zealand as a 3yo), 1.56.3 (in Australia as a 3yo), and 1:54.1 as a 4yo. In other words, his exceptional high speed was more than just a flash in pan as a 2yo. He carried that ability through the next two years, and developed the strength to carry his sprint further and further, and mix up his racing style to maximise his opportunities to use that speed to the best advantage. Credit here not just to trainer Geoff Small, but also to driver David Butcher, for the education that accompanied Tintin’s physical and mental development over that time. What’s in his genes that explains that high speed factor? Start with the immediate family. His dam is Zenterfold, who was very much an In The Pocket type of filly – medium height and slimline build with a very competitive attitude, and speedy. All her four wins were under a 2 minute mile rate and her best winning time was 1.56.6. She was good enough to win the Sires Stakes 3yo Fillies Silver. She comes from a very talented family with a lot of depth and breadth to it. Shining examples on various branches include Motoring Magic and Interchange, De Lovely and Copper Beach, Elsu of course, and closer to home Zenterfold’s half brothers Zensational, Zenad and the very talented Zenola Seelster (and doesn’t his turn of foot in the home straight remind you of Tintin In America). There is a mix there of sprinting types and staying types, but both types show the determination, will to win, and strength to hold speed that Tintin did. Tintin as a young foal himself. Just loved to run, and to run fast. Tintin was Zenterfold’s first foal – and all her other foals to date have qualified as 2yos. 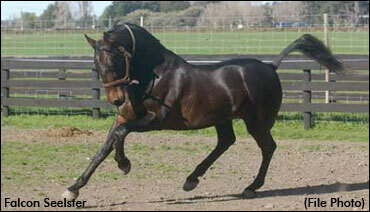 Zenstar (Falcon Seelster) held a NZ record of 1.55.8 as a 2yo. The Blue Lotus (Grinfromeartoear) has a career best of 1.56.6 and was 3rd behind Bettor Cover Lover and Carabella in the Sires Stakes 3yo Fillies Final. The Grin colt I bred and sold at the 2012 yearling sales has been noted by trainer Gareth Dixon as a nice type showing up early and probably heading to the 2yo Young Guns series. So that is why you can look at Tintin’s speed and competitive streak and have confidence it is not an isolated fluke. It’s very much in the genes. I chose McArdle as the sire for a number of reasons. Tintin has become McArdle’s best Australasian performer to date, and McArdle will need a few more to rise above the ‘good percentages’ category as a sire. But that is not an issue when looking at Tintin as a sire. Where McArdle adds value to Tintin’s siring prospects and to breeders confidence, is the compatibility of his genes with Zenterfold. Basically, the match is one which has increased the quality of Tintin’s genetic platform. Specifically, it underscores the speed attributes that Tintin’s dam provided through her In The Pocket connection and also (importantly) through her damsire New York Motoring. New York Motoring carries two high performing genes when it comes to raw ability and speed – Most Happy Fella on his y line and Shadow Wave on his x line. The branches of Tintin’s family that have proven to be strongest in terms of top performers are those that have New York Motoring in the mix – namely from the NYM mare Interchange (dam of Elsu, Falcor, Revonez, granddam of Copper Beach, great-grandam of De Lovely) and from NYM mare Zenola Star, dam of Zenterfold and Zenola Seelster and grandam of Tintin In America. In McArdle’s pedigree I was not so interested in Most Happy Fella as a double up, but that his presence on McArdle’s maternal line would help ‘call’ to the Shadow Wave factor in Zenterfold’s pedigree. I also liked the fact that McArdle’s grandam, Happy Sharon, a daughter of Most Happy Fella, was a very, very classy and fast racemare and a good producer from a range of sires. She was bred to Nihilator to get Lilting Laughter, McArdles dam, who got a couple of placings in her only 3 starts, but was a full sister to Smiley Face who racked up 42 wins and a best 1.53 in his career. Nihilator mares have also done well With Shadow Wave, and that also gave me a sense of compatibility in this McArdle x Zenterfold mix. Again, b4breeding blog readers will know that I hold Shadow Wave in high esteem as a factor in pedigrees through the maternal lines, and I was keen to tap into his contribution to Zenterfold’s genetic makeup. In a previous blog I suggested some mares that I would like to see Tintin get, but the range that he would suit is very wide. What he provides is a solid genetic foundation, and plenty of opportunity to tap into that. You might want to avoid a son of In The Pocket as the sire, but then again the double up would not be in positions that would worry me genetically. Likewise (or in the reverse) I wouldn’t rule out Falcon Seelster mares. But both of those options may carry some degree of risk re too much mental assertivenesss. That’s all I would keep an eye on. Tintin had a very assertive, although not nasty, temperament – he is a sire that would have survived in the wild, to be sure! This determination and mental focus on winning is a thread running through the family that turns the natural ability to run into racetrack performance. Mares to consider include those by Badlands Hanover, Live Or Die, Life Sign, Holmes Hanover. I’ll be cheeky enough to say Mach Three, Artsplace and Bettor’s Delight mares too, and only worry about size with Bettor’s Delight mares if it is your mare’s first foal and she is a small type herself. Mares with Albatross in their maternal lines – any Royal Mattjesty mares out there? – or with Soky’s Atom in their maternal lines would be a good match. also Grinfromeartoear mares that were tough but need an extra bit of speed. Another to consider if you want to upgrade and have a chance to inject speed in – Peruvian Hanover. And are there still some Lislea mares looking for a chance? What about those P-Forty Seven mares you don’t want to pursue as racehorses? Pacific Fella mares for a number of reasons could be excellent with Tintin In America. In Australia, you will have another whole range of mares who may fit some of the potential genetic or type factors I’ve touched on. And I’d love to hear from breeders who have gone to Tintin In America, what their mares are, and why they chose Tintin. Please post up as comments on this blog. I wish you every success with your foals!